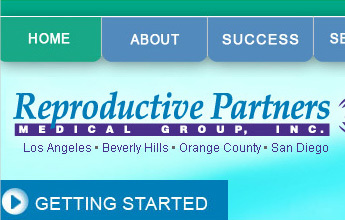 Reproductive Partners Medical Group came to TD Media after the success we demonstrated for their San Diego partner clinic, UCSD Regional Fertility Clinic. The group wanted to see the same results for the three additional clinics in Los Angeles, Beverly Hills and Orange County. TD Media provided a fresh, patient-focused design, wrote extensive copy for the site and migrated more than 200 static and dynamic pages to a new server with 301 redirects. "We are so pleased that we selected TD Media to design and manage our Reproductive Partners website. Under their guidance design and implementation we have doubled our volume and contacts. They changed our website from a static to a dynamic site. They are innovators of new ideas and get their work done quickly and the quality of the work is excellent." Arthur L. Wisot M. D.
The results were an 82% increase in new patient leads from the website within the first three months after launch. In the subsequent 12 months, new patient leads per month had increased 155%. TD Media provides ongoing marketing services for this client including PPC advertising, search engine optimization, conversion optimization, content development, social marketing and web hosting for this client.